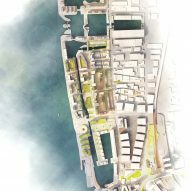 The design of the £5 billion development set to transform the northern docks of Liverpool, England, has been revised in response to concerns from the UNESCO conservation committee. New CGI visuals show the latest plans for the Central Dock section of the Liverpool Waters masterplan, which were changed after a warning from UNESCO that the development could cause the city's World Heritage status to be revoked. 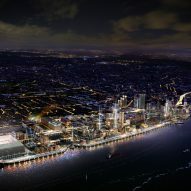 The 60-hectare mixed-use scheme will stretch two kilometres along the River Mersey, from Princes Dock to Bramley Moore Dock, the proposed site for Everton FC's new football stadium. Liverpool was added to UNESCO's List of World Heritage in Danger back in 2012, in response to the Liverpool Waters plans. Following that, the city council set up a special task group to rescue the city from threat. This group advised the the developer to revise the plans for the Central Dock development, shaving the top off some of the taller buildings in line with the city's new height cap. The revised scheme appears to have taken these recommendations on board. However there are still plans to build tall towers elsewhere in Liverpool Waters – Plaza 1821 and Hive City are both proposed for the Princes Dock end of the masterplan. "Central Docks has been revised based on consultation with the city council and other heritage groups," Paul Corcoran, head of marketing for the development, told Dezeen. "Buildings in the Central Docks development have been made smaller in height based on consultation, but the existing planning applications that have been approved for Plaza 1821 and Hive City remain unchanged," he said. "No revisions are being considered at this stage. They've already gone through planning." The two towers were granted planning permission ahead of the rest of the scheme in 2011. 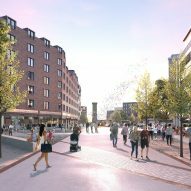 Detailed plans for the five neighbourhoods that form the rest of the masterplan must be submitted by August 2018 if the scheme is to retain its outline planning permission. Work has already begun on the 16-storey Plaza 1821, which will house 105 one- and two-bed apartments with commercial space at ground level. The 31-storey Hive City Docks tower, which will contain 278 apartments and a rooftop restaurant, is set to follow. 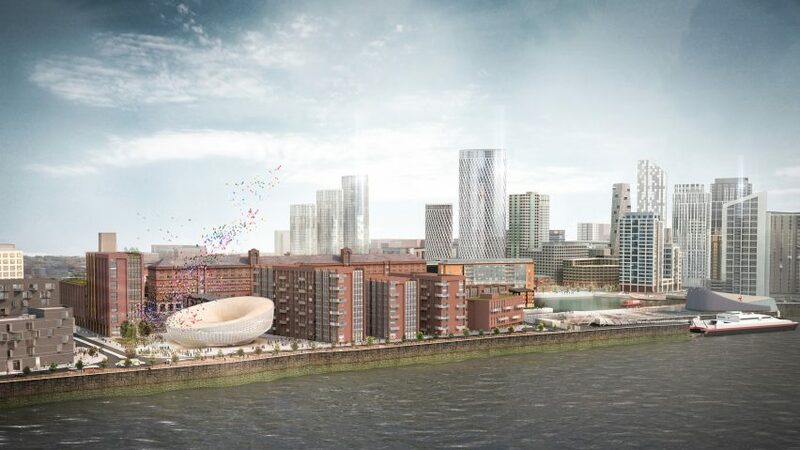 A document released by UNESCO's World Heritage Committee ahead of its annual meeting in July 2018, states it "repeatedly expressed its serious concerns over the impact of the proposed Liverpool Waters development" before work began. 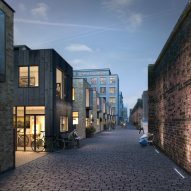 It states the decision to grant planning permission to the two towers exhibited "inadequate governance systems and planning mechanisms that undermine protection and management and therefore fail to sustain the Outstanding Universal Value (OUV)" of the site. Six maritime trading sites in Liverpool were originally inscribed on the World Heritage List in 2004 for their role in the growth of the British Empire. However, UNESCO has been considering the removal of all of sites from its register since the inception of the Liverpool Waters development in 2011. The World Heritage Committee will assess whether the revisions to the plans remove the threat to the area's heritage during its July meeting. This wouldn't be the first time for a site to have its World Heritage Site status retracted – the Arabian Oryx Sanctuary in Oman and the Dresden Elbe Valley in Germany have both been stripped of the title.